October 19, 1995 to be exact is the day when Enchanted Kingdom first open its gates to the public. Whether you believe it or not, the nation's top theme park is already 14 years of age and still counting. With 7 themed zones, over 23 rides and attractions, plus food and merchandise destination, EK is indeed a fairy tale come true to all theme park goers. “Teenhood is a time for new discoveries, exciting changes and experiences to try out. As we enter this phase of our existence, Enchanted Kingdom aims to bring to the next level that kind of service magic it has been famous for, keeping in mind the ever changing needs and wants of our loyal park goers. We strive to exceed our guests’ expectations with creativity, style and imagination,” said Mario O. Mamon, EK’s President and Chairman. As EK reaches its teen years, it continues to grow and evolve by introducing not only new attractions but also new servings such as shows and events. 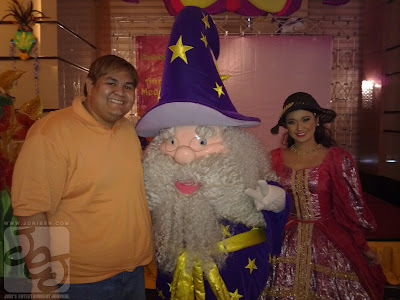 And as a token of appreciation to all loyal patrons of Enchanted Kingdom, the theme park prepared promos, events and gatherings from October to December as a 3 month long celebration and treat to everybody that will visit Enchanted Kingdom. For a start, EK will be granting a one-time 14th Anniversary Promo Special Regular Day Pass Rate of P320 on weekdays and P380 on weekends and holidays will be offered from October 1 to 31 to comemmorate the original ticket price when the Park initially opened in 1995. With this promo you can visit the theme park with a much lower price which is a good deal for everyone that will join the celebration the whole month of October. 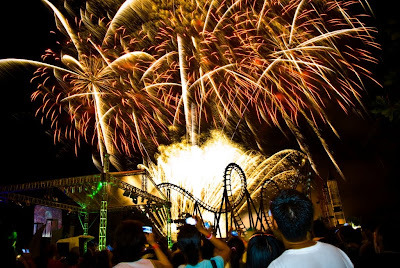 On the month of October, Enchanted Kingdom will be having the 2009 Annual Sky Wizardry Fireworks competition where local pyrotechnics manufacturers go head to head weekly. Be enchanted with artisticand magical fireworks in the sky and witness them as they illuminate the skies of Enchanted Kingdom on Oct. 3-4, 10-11, 17-18 and 24. The Celebration does not end there for a string of exciting new performances from Enchanted Kingdom circle of performers and artists are prepared including the Mardi Gras Halo-ween Parade Party featuring DJ Brit, Otaku Kingdom, the Simon and Silver Magic Show, Half-human, half-video Interactive and the much awaited Enchante: A Christmas Special. Also watch out for the park's Search for Enchanted Kingdom's Princess 2009 where young talented girls compete for this year's crown as the park's Princess. Cash, EK privilege cards and other prices awaits this year's winner which will be announce on the grand coronation night on October 25. With this offerings, I'm very sure that your stay in Enchanted Kingdom will somehow be something extra special these Anniversary and Holiday Season and management will assure to everyone that the magic will definitely stays with every one. Enchanted Kingdom is open on Thursday and Friday from 12nn to 7pm and Saturday, Sunday and Holidays from 11am to 9pm with a maginificent Fireworks display at 8pm. So grab your family and friends and visit Enchanted Kingdom, which is located at the city of Sta. Rosa, Laguna. 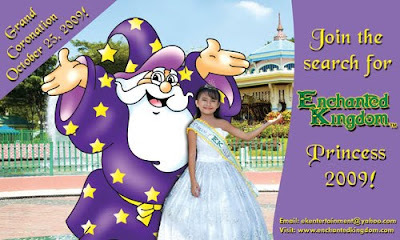 For more information and inquiries, visit www.enchantedkingdom.com.ph or call 843-6074 to 76 or 830-2111 to 16.